In 3.5 Eclipse-Databinding introduces a new API which should be used in favor of the 3.4 EMFObservables-Factory because it provides many features who couldn’t be provided by the old API (e.g. the new API provides you with the possibility to observe nested attributes in Table/TreeViewers, allows you do observe different object types in the same viewer which is very handy in case of a TreeViewer). Like in previous releases the Core-Eclipse-Databinding bundles define an API and provide an abstract base implementations and downstream modules need to provide the concrete implementation for the domain model implementation and its notification system. org.eclipse.emf.databinding.edit: Implementation which builds upon the EMF-Databinding-Core implementation but uses features provided by the EMF-Edit. Changes to the model instance are not made directly on the model-instance but are done by executing EMF-Commands on so called EditingDomain. Going through this additional framework provides us new features like Undo/Redo-Support. Naturally whenever you get new features you have to pay a price – going through this additional API causes a bit overhead. Now that we saw the highlevel overview it’s time to take a closer look at the new Eclipse-Databinding-API. It is called Properties-API because of the name of the root interface org.eclipse.core.databinding.property.IProperty. If we have a CommitterShip instance we are not able to directly access the last name but have to go through the person-property. What we are doing here is traversing the object-tree to get access to the property we are interested in and this traversal is often referred to as following a path through the model. Observing nested properties is quite a common use case but the 3.4 Databinding-API didn’t provided such support out of the box though it was available in some situations. This changed with the new Properties-API which has built in support for nested properties and so the EMF-Databinding honors this with a set of factory methods (see below for more informations on this) and one special class describing the path to a nested property. 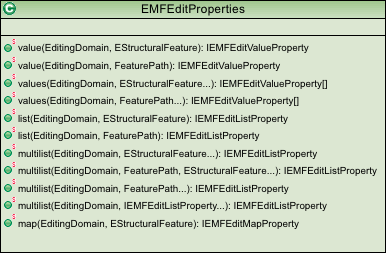 This class provides factory methods to create instances of IEMFValueProperty, IEMFListProperty and IEMFMapProperty by passing the EStructuralFeature or the path to a nested EStructuralFeature the property should represent. 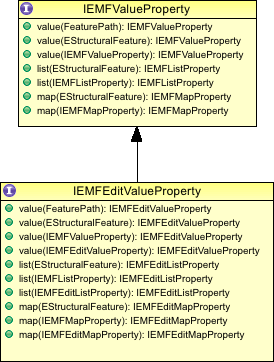 This class provides factory methods to create instances of IEMFEditValueProperty, IEMFEditListProperty and IEMFEditMapProperty by passing the EStructuralFeature or the path to a nested EStructuralFeature the property should represent and the EditingDomain through which the modifications are made. The IValueProperty implementations IEMFValueProperty and IEMFEditValueProperty provide the possibility to create observables of single value attribute/properties of an object like the lastname of Person. Let’s take a look how we can use this new API in our Java-Code. Code below only uses the Pure-EMF-API and not the EMF-Edit one because the only difference would be the creation of the IValueProperty (The EditingDomain has to be passed there). 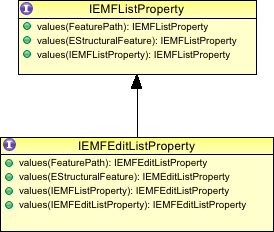 The IListProperty implementations IEMFListProperty and IEMFEditListProperty provide the possibility to create observables of multi valued attribute/properties like e.g. subprojects of a project. We are not useing maps in the example code so I’m not going to show the API in detail here but the idea behind it should be quite obvious. 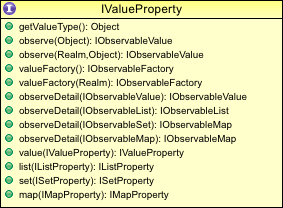 With the type of properties you can observe an java.util.Map-Type of multi-valued property. You might ask why those to files are grayed out a bit in the screenshot. The reason is that support for this didn’t made it into EMF 2.5 but we are looking into it for 2.6. The IProperty API is quite an impressive piece of API – extremly powerful but still easy to use and in the next parts of this blog series we’ll see most the API in action. One of it’s big advantages is that it decouples the creation of the observable from specifying which attribute/property from which domain model one likes to observe which is really powerfull when it comes to writing API code which should be domain model agnostic. Suppose we write a library on top of Eclipse-Databinding which allows us to create text-input-forms in a more condensed way but the API should be useable with any domain model technology. If we’d used the 3.4 Observables-Factories like (BeanObservables, EMFObservables, EMFEditObservables) we would have to write an specialized implementation for every widget technology because the specification of the attribute and how the binding is created is different for each of them. Using the new Properties-API which defines a common description of a property a observable is going to be created later would lead to an API like this. The UFaceKit-project has a similar abstraction to provide domain model agnostic API so something like this was doable also before the introduction of the new API. Still having this concept at the core of the implementation is highly appreciated. Now that we got introduced into the most important parts of the new Properties-API we are ready to start working on our programm in the next blog series.